A top Taiwanese official on Wednesday said Taipei may send a delegation to Beijing to learn more about a fraud trial involving some 45 Taiwanese nationals who were deported from Kenya and sent to mainland China against their wishes. Taipei has accused China of abducting the group, which faced accusations in Kenya of committing telecommunications fraud. Analysts say Beijing may be trying to force the soon-to-be ruling party in Taiwan to start a friendly dialogue with mainland China, rather than veering toward stronger self-rule, which goes against Beijing's wishes. "For this kind of case, I must say that we will try to get our citizens back [to Taipei] for trial," Andrew Hsia, who heads the island's Mainland Affairs Council (MAC), told VOA's Mandarin Service. "But China will contend, too, since the victims are already over there. So both sides will coordinate on the basis of judiciary assistance." Hsia also said there used to be cross-strait cooperation and a tacit understanding between the two sides in dealing with similar cases. If mainland China thinks a sentence for fraud in Taiwan is not heavy enough, he said, there would be room for discussion. The deportations that Taiwan’s government describes as an abduction of its citizens that was coordinated by China and Kenya follows other moves that analysts call pressure tactics against Taiwan since the island’s January 16 presidential election. China has considered Taiwan as part of its territory since the Communists won the Chinese civil war of the 1940s and insists that the two sides eventually unify. Taiwan’s Nationalist government of the past eight years has set aside differences to negotiate a series of deals with China, which in turn has dropped its overt hostility of the past. But Beijing has no such relationship with the Democratic Progressive Party of President-elect Tsai Ing-wen. 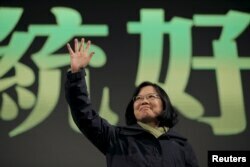 Her party advocates stronger autonomy for Taiwan, meaning more distance from China. FILE - Democratic Progressive Party (DPP) Chairperson and presidential candidate Tsai Ing-wen waves to her supporters after her election victory at party headquarters in Taipei, Taiwan, Jan. 16, 2016. Since Tsai’s election, Beijing has scaled back permits for Chinese tourists to Taiwan, according to a government report in March. Also last month it established diplomatic ties with The Gambia, a former Taiwan ally in Africa. This month, Chinese buyers suspended a five-year deal to import milkfish from Taiwan. On Friday Kenyan authorities ordered eight Taiwanese people to fly to China despite their pleas to return to Taiwan. Kenya deported another 37 to China on Tuesday. A Kenyan court had ordered them out of the country on suspicion of telecommunications fraud, though a court had cleared 22 of unlicensed telecom equipment use. The island’s top China policymaker Andrew Hsia called his counterpart in Beijing on a hotline Tuesday, and the government in Taipei says it plans to sue three government agencies in Kenya. Tsai has said she wants dialogue, but disputes Beijing’s precondition that each side see itself as part of a single China. She will take office May 20. “My first thought was this may be a diabolically clever method discovered by Beijing to simultaneously reinforce its claim to sovereignty over the people of Taiwan and also make it harder for [Taiwan’s] citizens to do business overseas, putting more pressure on Taipei to make a deal with Beijing,” says Denny Roy, senior fellow at the East-West Center think tank in Honolulu. 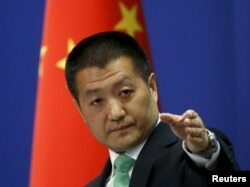 FILE - Chinese Foreign Ministry spokesman Lu Kang addresses reporters at a news conference. Beijing may just be asserting the right to try Taiwanese in its courts, said George Tsai, a retired university political science professor in Taipei. China’s state-backed Global Times newspaper said in a commentary Tuesday that because the Taiwanese still face “charges of fraud,” adding it was legal under international law to “extradite” them. But the mother of one of the men deported to China was quoted by Taiwan’s Apple Daily newspaper as saying her son was a music professional who had visited Kenya for pleasure with a friend.